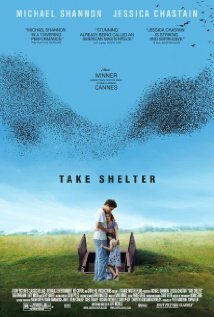 Take Shelter is an intelligent film that asks difficult questions about mental illness — specifically, schizophrenia. It is not an easy watch by any means, but it is one that will elicit powerful emotions upon its conclusion. Michael Shannon, in a groundbreaking performance, is Curtis LaForche, a construction worker living in Ohio with his wife Samantha (Jessica Chastain) and his six-year-old daughter Hannah (Tova Stewart), who is deaf. He works hard to support his family, but their financial problems have them in danger of losing their home. Perhaps triggered by the increasingly stressful situation, Curtis begins have lucid, intense nightmares. He dreams of an impending apocalypse, a storm of epic proportions that will wipe out the world as he knows it. The nightmares don’t stop. Believing these dreams to be more and more as prophetic visions, Curtis begins to build a storm shelter in his backyard. This is when the film kicks itself into high gear. People take notice of Curtis’s erratic behavior. He begins to have problems at work. He is paranoid of those who appear in his dreams. His once-stable family has become strained. Things are going downhill, and fast. Here’s the kicker: Curtis’s mother was diagnosed with schizophrenia when she was in her thirties. Could he be suffering from the same illness? His behavior certainly suggests this. Or is he a prophet, able to see the future and trying to warn us of the forthcoming doom and gloom? For much of the film’s runtime, we are forced to answer this for ourselves. This culminates in an unforgettable ending, one that has provoked deep and meaningful discussions from others. It has been a week since I watched the movie, and I still can’t stop thinking about it. What we decipher from this, I feel, ultimately says something about ourselves. Truly, this is an experience that will make all of us look at mental illness in a different light. I don’t know if I have seen a better movie about mental illness, and much of the credit for this goes to to the stellar cast. Michael Shannon is a tour de force here, rightfully deserving to be mentioned among last year’s biggest Oscar snubs. Jessica Chastain is the perfect counterpart to him, a caring and loving wife who does her best to support her husband even when times are rough. I feel she should have been nominated for this rather than her role in The Help. 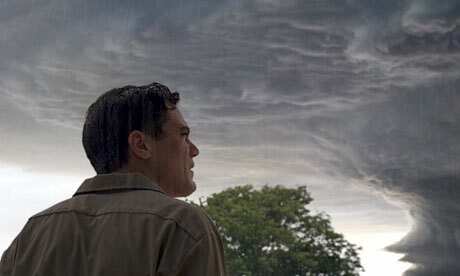 Quite frankly, Take Shelter is one of 2011’s best films. Period. Grossly overlooked by many, this is an unforgettable movie that would surely be in my top five from the year. Now that it is available on DVD, there is no excuse to miss out on this recent gem. sounds interesting! will look out for this. It’s great, Shane. You’ll have to let me know if you check it out. Yay, another review hyping this movie! Hopefully it’ll find the audience and life it missed in theaters through DVD! Yeah, I sure hope so. I wanted to catch it at the theater, but it didn’t stick around very long, unfortunately. The DVD release should give it new life. I could see that, Scott. The movie is a little slow, but I was still able to get hooked pretty easily. Great review, I also gave it a 90% (9/10). I didn’t get a chance to see it in theaters because it didn’t play near me. But I made sure to not even hesitate to get it on DVD since it received all this praise and it was mind blowing. It zigs and zags never giving you a chance to try and figure out what is going on. The performances were phenomenal especially Michael Shannon (he was definitely snubbed out of a nomination). And yes like Scott Lawlor says above it does drag a bit in the middle but overall the finale changes everything and ties it all together excellently. Completely agree, Amanda. I loved how the movie kept us guessing the entire time and then capped it off with a phenomenal ending. At least Michael Shannon is getting props from elsewhere, even though he was overlooked by the Oscars. Glad to hear you enjoyed this movie. Thanks for the comment! I definitely understand your very warm reception to the film and I can’t really say I disagree with you on most of your thoughts about the movie. The biggest divergence I found between your review and mine is that you were more surprised and captivated by the ending than I was. I feel like if I had not seen it coming I would have probably enjoyed it more. Great review though. Take Shelter will probably be just outside my top 10 by the time I’m done with movies from last year. Thanks, Niels. I don’t want to get into spoilers, but I loved how open-ended the finale was. There are all sorts of theories going around as to what really happened, and it has spurred some interesting thoughts. It was just as much fun to discuss the movie afterward as it was to watch it. To me, that is powerful film-making. Glad to hear you enjoyed this one as well. Very good flick with a perfect performance from Shannon and it’s a real shame that he didn’t get any type of Oscar love for this flick but then again, it’s no surprise. Good review Eric. Thanks Dan. Yeah, it’s a bit of a bummer that Michael Shannon didn’t get an Oscar nomination, but at least he got a lot of attention for being one of the biggest snubs. I’m glad I caught the film in theaters. What a chilling and great film. Good review Eric and it was so criminally overlooked. Thanks Sam. I would have loved to see this on the big screen, but it still hit the spot on DVD. Amazing film. Michael Shannon gives an excellent performance and Jessica Chastain is quickly becoming one of my fave actresses. I also liked that the movie keeps you guessing whether it’s all a figment of his imagination or not until the end. However, I did feel it could have been cut down a bit because some scenes didn’t really advance the story and it’s already a pretty slow paced movie as is. I hear ya, Castor. Shannon and Chastain are just awesome in this. It seems a lot of people had problems with the movie’s slow pacing, but I was so entranced in the movie’s atmosphere that I didn’t mind at all. I missed this when it hit the big screens. Or rather, it just didn’t stick around on the big screens for long enough. Looking forward to catching it. Haven’t read a single bad review. I hope you’re able to check it out for your 100 Movies Project, Jaina. Would like to hear your thoughts. I like to think of this movie as Field of Dreams, but replace the baseball with schizophrenia. Ha! That is actually a really good comparison. Thanks dude. If I were to revise my top 10, I would probably put Take Shelter at #3, just below Drive and 50/50. It really is unfortunate how overlooked it was last year. 9/10? Wow, now I really want to see this though after reading this I’m even more convinced it’s somewhat similar to A Beautiful Mind as far as what’s happening to the main character. I do think it’s worth a watch for Shannon’s performance, oh and Chastain whom I like very much. Great review, man. I haven’t seen A Beautiful Mind, so I can’t compare, but if it’s anything like Take Shelter than I must give it a watch. If you are a fan of Shannon and Chastain, then I think you will appreciate this even more. Hope you’re able to see it soon, Ruth! One of the best movies I’ve seen in a long time. Such a well acted and executed film too. Missed the boat on this last year but saw this a few weeks ago and fell in love with it as well as that haunting score. Though for me I would rank this better than 50/50…it’s OK but I don’t get the “it’s great” appeal…maybe it was Seth Rogen who did’t hit be right. Yeah, I’m kicking myself for missing the chance to see this on the big screen. Such a great movie, and clearly one of last year’s most underrated. Glad to hear you enjoyed it as much as I did.